College football fans proudly show their love the flag and what it stands for. The display of patriotism in the stadium was nothing short of breathtaking. Colin Kaepernick’s refusal to stand during the national anthem has generated a furious debate across America. Some of his NFL peers have blasted him for his decision. While others, like Denver Bronco Brandon Marshall, have joined him in protest. Now Virginia Teach and Tennessee, two college football teams, have weighed in on the controversy in a massive way. In Saturday’s night game between the rivals, a record breaking 150,000 people were in attendance. When it came time for the pre-game anthem, the display of patriotism in the stadium was nothing short of breathtaking. 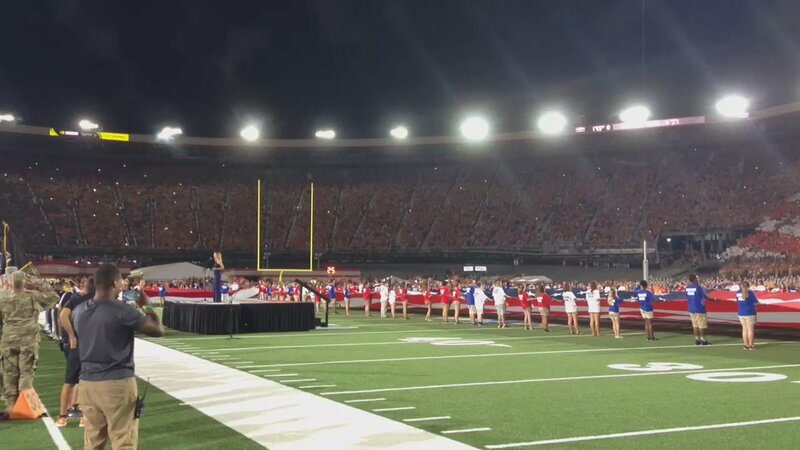 While the debate about patriotism and athletes has created division in the nation in recent weeks, what happened at the game between Tennessee and Virginia Tech shows just how passionate Americans are about the national anthem.